We build every project to your specifications. Our skilled team of engineers and craftsmen work under our direction to design, engineer, and deliver custom designs and fabrication reflecting your individual vision and style. Founded in 2005, CK Valenti Designs is an innovative, Chandler, AZ-based specialty fabricator. Our engineers and craftsmen work in wood, metal, plastics, lighting, and technology, delivering full service custom solutions for displays, informational exhibits, and fully interactive experiences. From design to engineering, creation to installation, we deliver superior quality, turn-key solutions to engage and educate. As a business that focuses on custom design and fabrication work, we welcome projects of all shapes and sizes. If our galleries don’t have exactly what you’re looking for, that doesn’t mean we can’t bring your project to fruition; we just haven’t worked on one like it yet. We work with museum directors, interior designers, business owners, architects, and homeowners. Every project we undertake is unique and each client has a specific set of needs. We work closely with our clients to identify their needs and deliver a finished project that meets those needs. You bring us an idea or a design and we get started with a discussion about your project. Next, we work together to choose the right materials, colors, and textures for the piece. We may request to visit your location to survey the site where the piece will ultimately live. We produce a quote for the price of the project. Depending upon the project, we may request a deposit for drawings to be produced. We produce drawings of the design and work with you until the design is just right. You provide 1/2 the project cost as deposit. We execute the project (and deliver and install if applicable). We collect your final payment. You enjoy the final product! We look forward to working with you. Contact us to start your project. 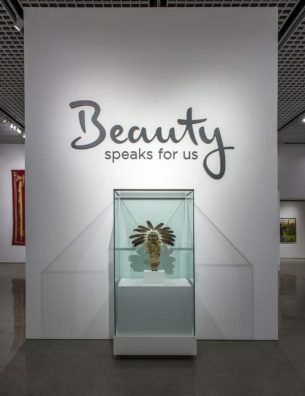 Photograph by Craig Smith, Heard Museum.